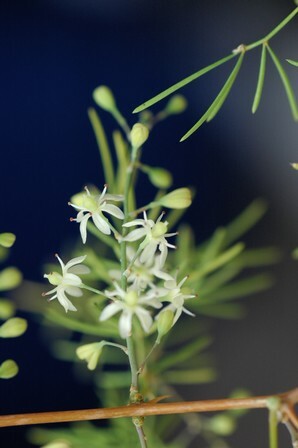 Asparagus fourei (Oberm.) Fellingham & N.L.Mey. A rare, range-restricted Sekhukhuneland endemic. As it is restricted to dolerite outcrops it is somewhat protected from mining and associated expanding human settlements as mining tends to impact more severely on mineral rich norite. There is however a potential threat of habitat degradation to some of the subpopulations that occur near human settlements. Mixed bushveld, on rocky, dolomite outcrops. This species tends to grow on dolomite outcrops, and does not occur on norites. This offers it some protection from mining, the biggest threat to Sekhukhune endemics, as norites are mineral rich and favoured for mining. The hills around Penge mine and north of the Olifants River are not as densely populated as other areas elsewhere in Sekhukhuneland and do not suffer the intense grazing pressure that other areas do. The subpopulations within this region are at present not seriously threatened. However around Moshira and Burgersfort, there are settlements, and the plains are extensively cultivated, especially around Moshira. Although the rocky koppies are not impacted by infrastructure development and agriculture, they may be subjected to degradation due to firewood collecting and overgrazing, especially by goats. This may potentially threaten subpopulations in this area.